It’s autumn in North America which means the new crop of apple varieties are readily available in the markets. One of The Armenian Kitchen’s readers/contributors, Lindsay Peckham, asked me to recommend an apple that would best suit the apple dolma recipe she wished to make from the AGBU’s cookbook, ‘Treasured Armenian Recipes’. Since apple preferences are such a personal thing, and apple characteristics and uses vary, I suggested she check out the useful information from The Farmers' Almanac website. Lindsay did just that, and decided Granny Smith apples would be perfect. There were some issues with the clarity of the recipe, however. For instance, the first ingredient listed in the recipe read: “enough apples”. How many does that mean?? I reminded Lindsay that the older generation had no written recipes, and if they did, the instructions left a lot to one’s imagination. Once Lindsay decided on the Granny Smith apple, she made the dolma with her husband’s help. “My husband Jay and I made the apple dolma. 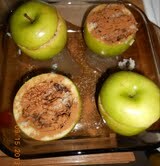 I found the inside mixture very easy to make, but coring the apples was difficult to say the least. The first two we did we went right through the bottom. And of course once they were cored we had to cut around even wider to make room for the filling. The texture of the apple does not make this an easy feat. Even though two had holes in the bottom we still filled them with the mixture because we didn't want to waste the apples. Surprisingly, they turned out fine and none of the filling came out. We used Granny Smith apples. We paired the dolma with some rotisserie chicken we bought at the store and voila! A wonderful Fall meal! While I followed the ‘Treasured Armenian Cookbook’ recipe, I was a little disappointed in the vagueness of the recipe. For example, they don't say approx. how many apples to use, instead they just say "enough apples". Also, they never say whether to peel the apples or not. My assumption was to peel them, but I was so caught up in coring them and thinking about the next step that I totally forgot to peel them until it was too late! The recipe also called for 1 cup of sugar and I had loads of sugar left over. I'm not sure if I didn't use enough, but it seemed like if I had used the whole cup it would have been way too much. I’m glad Lindsay didn’t peel the apples since the skin helps the apples to hold their shape during baking. Her selection of the Granny Smith apples was an excellent choice because the tartness of the apple balanced the sweetness of the sugar in the recipe. Bravo to Lindsay and Jay! We thank you for sharing your culinary experiment with us all. Apple Dolma from”Treasured Armenian Recipes”, Detroit chapter of the Armenian General Benevolent Union, Inc.
1. Slice off the tops of the apples and save. Core the apples removing a sufficient amount of the apples to allow for filling with mixture as described below. 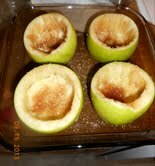 Use approximately ¼ cup sugar by sprinkling it in the apples that have the center removed. 2. Add rice to boiling water and cook ten minutes. Add raisins and cook 5 minutes more. Remove from heat and strain the water from the mixture; pour cold water over mixture and strain again. Add ¼ cup sugar and butter to above mixture. 3. 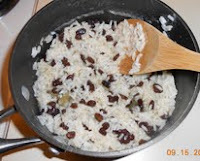 Fill the apples with rice and raisin mixture; add ¼ tsp. cinnamon to the top of each apple. 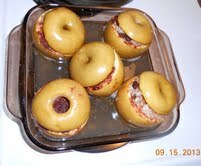 Cover with apple top that was removed; sprinkle a little sugar on each apple and arrange in baking dish. Put 2 cups of boiling water in bottom of baking dish to which the remaining sugar has been added. 4. Cover baking dish and bake in 350°F oven until apples are soft, about 30 minutes. Baste apples with liquid from the bottom of the dish from time to time. When apples are almost cooked, remove cover, and bake another 10 minutes. Sonia Uvezian's cookbook has a variant that uses apples and quinces. Also, the filling is made with meat. It also turns out that, once you get the hang of the filling, you can use it to stuff pretty much any fruit: apricots (large ones), peaches, even honeydew and cantaloupe. Yes, Ara, and we can't forget Ghapama, stuffed, baked pumpkin! there is a similar recipe in Armenian traditional cuisine called GRILLED APPLE, used to prepare at the holiday of Vartevar. it’s a habbit not to eat apple until that holiday, as it is forbidden to eat grapes before Astvatsasin. instead of rice, you stuff the apple with raisin, nut, honey & butter, then bake it in the oven.